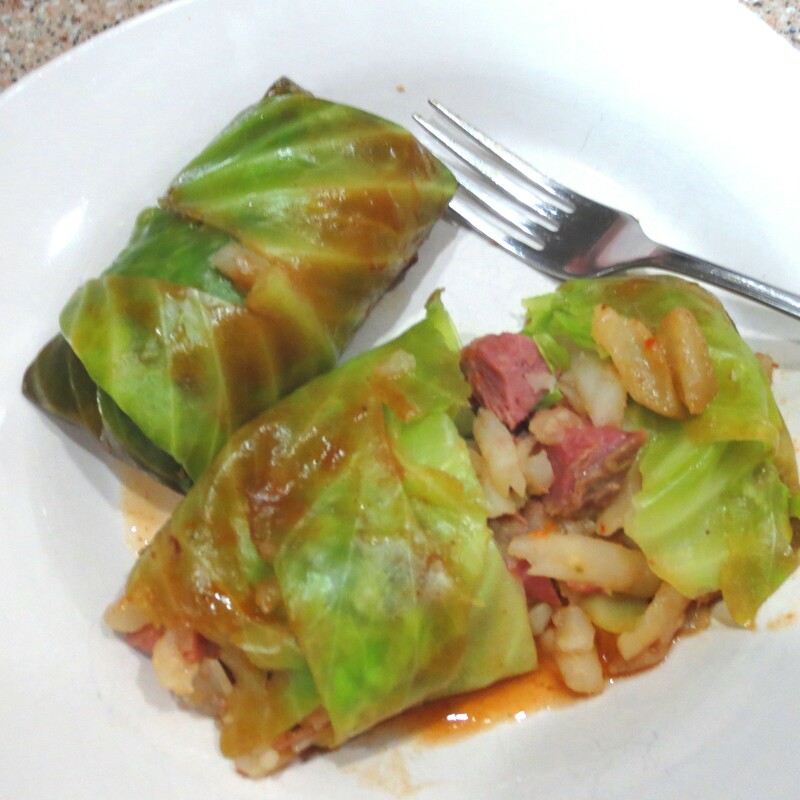 I make these stuffed cabbage rolls from the leftovers of my Slow Cooker Corned Beef Dinner. Start by pulling off 8 large cabbage leaves to save before the rest of the cabbage goes into the slow cooker and save any remaining au jus when you’re through. You’ll need it for this dish. I prefer the seasonings in O’Brien style refrigerated hash brown potatoes, but if you can’t find those, doctor up plain ones with any seasonings you like. 1. Preheat the oven to 350°. Lightly mist a 2 qt baking dish with cooking spray. 2. Bring a large pot of generously salted water to a boil. Add 8 large cabbage leaves and boil 4 minutes, or until just pliable. 3. While the cabbage is boiling, combine 1/4 cup of the au jus with the remaining ingredients. 4. Remove the cabbage leaves from the pot to drain. When cool enough to handle, cut out the toughest part of the stem in a V shape. 5. Spread about 1/3 cup of au jus in the bottom of the baking dish. 6. Working with one cabbage leaf at a time, place about 1/3rd cup of filling in the center of the leaf. Fold the sides in over the filling and roll up burrito style. Place seam side down in the dish. 7. Pour the remaining au jus over all the cabbage rolls. Cover and bake for 45 minutes, or until hot and bubbly.